The last few years have brought many new challenges and exciting opportunities to Betenbough Homes and our home buyers. We continually work to source the best products for our homes at the best price, so home buyers in West Texas are able to afford a great, new home they may have never imagined possible. With different products in our homes, exciting events and new floor plans coming later this year, we quickly realized we’d outgrown our current website. We have been diligently working to figure out what features our home buyers want to see on a new website and crafting a site with those features over the last six months. You’ll quickly notice the new site more accurately represents the current Betenbough Homes brand. As West Texas changes and continues to grow, so have we. We have adapted and continue to do so to fit our home buyers needs and wants. What’s different about our new website? For starters, the look and feel has been completely updated. We started a brand redesign a year ago by first updating our logo, which you’ll see on just about every Betenbough builder’s truck, around our office and in ads. The layout of our new website is similar and also incorporates images of the exterior and interior of our homes that allow home buyers to better see the details of our floor plans. Click on the “Virtual Design Center” link to access this home’s interactive floor plan. This allows visitors on our site to place and position furniture in rooms in a way they might once their home is built! Interactive floor plans also allow visitors to peek inside the home via interior renderings. 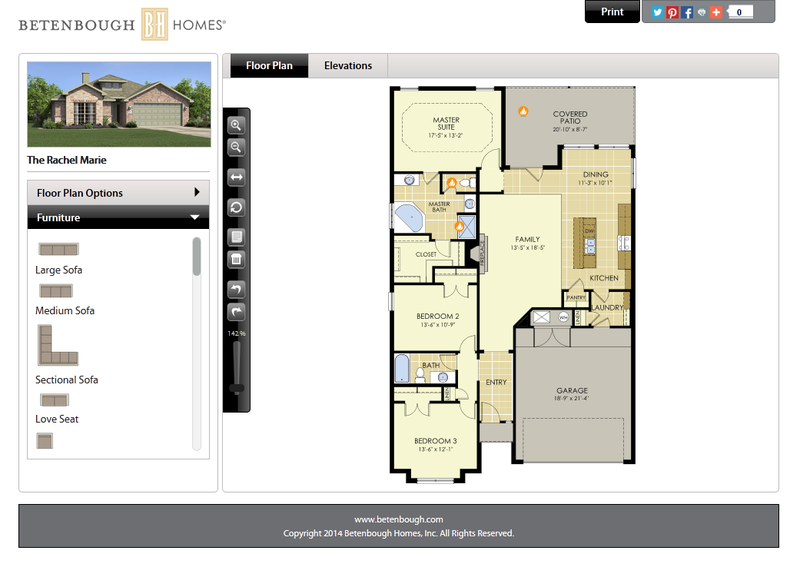 Interactive floor plans feature “hot spots” designated in orange that allow you to see interior renderings of the home. Our company is about more than just building homes. We strive to make an impact in our communities and even around the globe. Over the years, we’ve partnered with dozens of nonprofit organizations in our communities and our employees even have the unique opportunity to go on company mission trips to serve at some of these organizations. Our website’s ministry section now better exemplifies the full scope of our ministry and gives you a peek into Betenbough Homes’ company culture. We are thrilled to finally launch the new, and improved Betenbough.com and invite you to take a few minutes to see it for yourself!